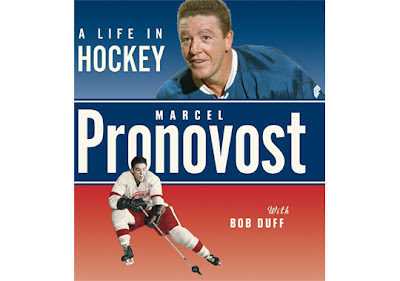 Hockey Hall of Fame defenseman Marcel Pronovost has released his autobiography. Written with veteran writer Bob Duff) Marcel Pronovost: A Life in Hockey is a fantastic new release. Marcel Pronovost was a fantastic defenseman in the 1950s and 1960s. The Hockey Hall of Famer won an amazing 8 Stanley Cups! A hard hitting, physical defender, he paid dearly with many trips to the hospital. But he was steady defensively and at times spectacular with his rushes out of his own zone. I compare him favourably to a young Ed Jovanovski. The past couple of years I have found myself quite enamoured with these coffee table style autobiographies. Bobby Hull and Stan Mikita have found critical success with such releases in recent years. Pronovost and Duff are trying to make it a natural hat trick. I think they succeed with this release, though they will have to fight for it. Though he is a Hockey Hall of Famer, Marcel Pronovost is not a household name like Hull and Mikita. Also, the book does not have the same colorful presentation of the Hull and Mikita books had. The project does have a different publisher after all. But the book it is loaded with tons of black and white images that nicely capture an era long gone by.. And the writing is very solid. Pronovost recalls his days with Detroit and Toronto, talking about his many battles, big games, and friendships. Of particular interest was his friendship with Terry Sawchuk, which Pronovost dedicates an entire chapter to. He also proudly looks back at his time as a coach and as a scout, for which he is especially proud. This is a solid book and a great introduction to a Hockey Hall of Famer most fans nowadays are not aware of. Even more knowledgeable fans are sure to learn something in the 200 pages of Marcel Pronovost's memories. If you are interested in players of yesteryear or of the Detroit teams of the 1950s or Leafs teams of the 1960s, you will enjoy this book.